How Badly are Fear, Finite Resources Hurting the U.S.? Image of hazard symbols for weapons of mass destruction — radiation, biological and deadly — by Wikimedia user Fastfission via Wikimedia Commons. Today, three unusually succinct questions from the same “Charles” to which I’ll reply as a group. Question 1: With Sept. 11, et al., education in science suffers because knowledge is threatening. When I was growing up (in the 1950s), I got books on amateur rocket fuels from the public library. Isn’t fear painting us into oblivion? 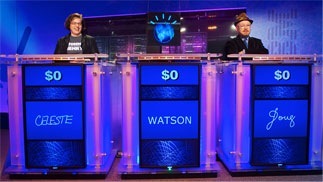 Question 2: IBM’s Watson seems a major step to automation taking over, i.e., employment being unnecessary. What kind of an economy does that imply? Question 3: Growth is the answer, right? But the Earth’s resources and environment are all finite. Isn’t a crunch inevitable? Paul Solman: So, first, “Isn’t fear painting us into oblivion” because we can’t, for example, get the equivalent of those amateur rocketry books from the ’50s? My fear, Charles, is precisely the opposite: that because the knowledge of how to destroy via technology is dispersing faster than ever (think WMDs and Iran, say), and is ever cheaper to obtain (think of the Internet or ricin), humankind’s ability to trigger oblivion is growing by leaps and bombs. Second, you ask about “Mr.” Watson (I presume he’s male because of his voice). I’m sympathetic to the view of MIT’s Eric Brynjolffson, as expressed in a recent story of ours, that the implications for employment may be grave. Automation has long been feared as a job-killer. President Johnson commissioned a report on the dangers in the 1960s. The basic message that came back: Not to worry. But the world has changed inexorably in the years since. Information technology creates new occupations, but “webmaster” and “programmer” and “software engineer” are not jobs for the masses, as were the industrial revolution jobs of the past. Automation is gaining on us and one can imagine — imagine, not know — that a sizable portion of the American public may have nothing to sell that other people are willing to pay for. That implies a very unequal economy, which is why we think the inequality story is so important and have been trying to cover it — see here, here and here. We’re continuing work on our inequality series. Third: “Isn’t a crunch inevitable?” No. Economic growth is getting more of what we want, or will come to want. But the process is one of rearranging the atoms with which we’re endowed, plus the forces of nature, plus the free photons pouring in from the sun. And that’s only here on planet Earth. Will we harness all we’ve got before some cataclysm turns back the clock? How the heck would I know? “Inevitable” implies that someone does.